Naturopathic doctor Lara Briden wants to give women the knowledge and tools to improve their period health. Half the population will menstruate in their lifetime, and 1 in 2 women will struggle with their period health. Lara's book, previously self-published, has already garnered rave reader reviews because of its willingness to deal with this important aspect of women's health openly and compassionately. Containing invaluable advice for women of every age and circumstance, and detailing natural treatments from nutritional supplements to a healthy diet, this book promises to help women change their relationship with their menstrual cycle. Topics include how to come off hormonal birth control; what your period should be like; what can go wrong; how to talk to your doctor; treatment protocols for all common period problems, including PCOS and endometriosis. Thoroughly researched and written in clear and accessible language, Period Repair Manual is the ultimate guide to better periods. Lara Briden is a naturopathic doctor with more than twenty years experience in women's health. She runs a busy hormone clinic in Sydney where she treats women with PCOS, PMS, endometriosis, and many other period-related health problems. 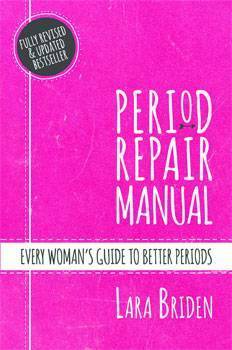 Question: What inspired you to write the Period Repair Manual? Lara Briden: I was inspired to write Period Repair Manual by my twenty years of work with my patients. For example, my patient Emily was about the thousandth patient who said to me: "I'd like to come off the pill, but I need it for my period pain." And I thought: "Women everywhere have the right to easy, pain-free periods!" So I put together a compilation of all the simple diet and nutritional treatments that have worked for my patients over that past two decades. Question: How would you describe a 'normal' period? Lara Briden: Counting from "day 1" of one bleed to "day 1" of the next bleed, a healthy period should arrive every 21 to 35 days, if you're an adult, or every 21 to 45 days if you're a teen. It should arrive without premenstrual symptoms and without pain, and should not be heavier than 80 mL (sixteen filled tampons) over all the days of the bleed. Question: What is the first thing we can do, today, to change our relationship with our period? Lara Briden: The way to love your period is to understand that a healthy natural menstrual cycle is how you make the beneficial hormones estradiol and progesterone. Female hormones are good for bones, muscles, mood and metabolism, and they're every bit as beneficial to us women as testosterone is to men! Question: Is there a treatment for PCOS that doesn't involve a hormone pill? Lara Briden: The best treatment for PCOS is a diet that is lower in sugar and nutritional supplements such as zinc that can improve facial hair and acne. In the long-term, those treatments work far better for PCOS than the pill because the pill has actually been shown to worsen the metabolic condition of insulin resistance that is a big part of PCOS.